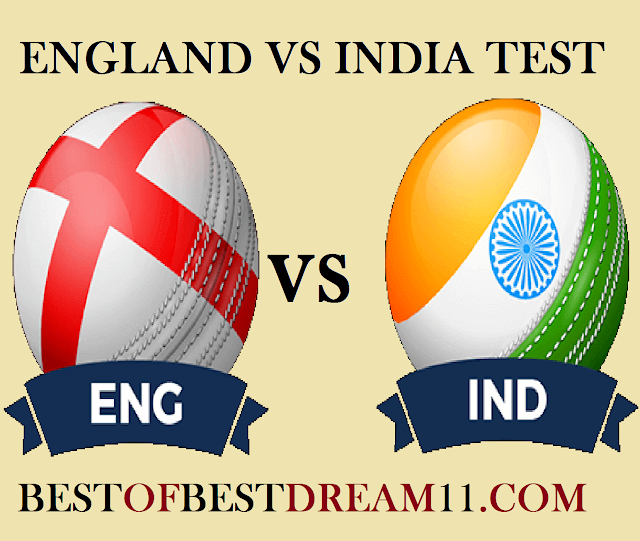 Here is best "ENGLAND VS INDIA" , Second Test match,(India tour of England), DREAM11 Predictions for the Fantasy user ,who venue are looking to make a strong team for maximum win. We are providing latest news, match update, information about the match .The team is picked by using various factors on the basis of performance, ground stats and latest form. In the five-match test series England won the first match and took 1-0 lead in the series. Team India will now look to bounce back to level the series ,when they take on the England team in the second test at the lord's cricket ground. 1-For England, Alastair cook is the highest run scorer at lord's in England team. He has amassed 1238runs in 18 test match. 2-Keton Jennings (42&08),Joe Root(80&14),Jonny Bairstow (70&28) and Sam currun (24&63) played good inning in the last match (first test). 3-in bowling, Sam currun(5wkt),J Anderson (4wkt) and Adil Rashid (3wkt) will be crucial for the team. 4-for india, Virat Kohli is the only batsman who has faced England's stubbornness.In the last Test match, he played a magnificent innings of 149 and 51 runs in both innings. 5-M vijay(20&6) and shikhar dhawan (26&13) did not perform anything special in the last match. 6-in bowling, R Ashwin(4&3=7wkt) and I Sharma (1&5) will be crucial for team. 1- For England, Ollie Pope is selected instead of Dawid Makan. 2-England will be without Ben Stokes, who is involved with his affray trial. 3-Chris woke and Moien Ali join the england squad. 4-The Indian team can return with a two-spinner on the Lord's pitch, thus Kuldeep Yadav can get a chance. 5-There is confusion about KL Rahul and C pujara playing in the Indian team.Team management will decide this before the match.